Our end of season summer sale has now started both online and in store in Bourg d’Oisans. We have a selection of Alpe d’Huez , Galibier and Croix de Fer Jerseys and T shirts plus an assortment of other cycling related goodies. 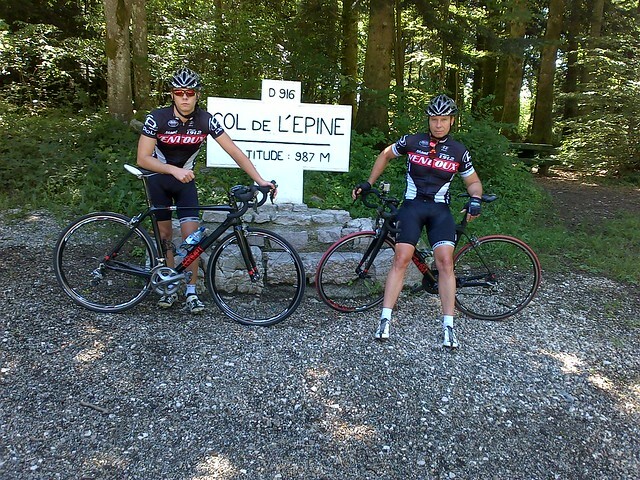 A couple of pictures from some Aussies doing the Alpe with Prompt…. Purple Alpe d’Huez Jersey anyone ? Our Alpe d’Huez Jerseys have proved very popular both at our shop in Bourg d’Oisans and also through our online shop. Due to a few requests we are now introducing some new colours to the range. The first will be in purple. Stock is expected in at the end of May 2014. Delivered just in time for Christmas we now have a small number of PROMPT shorts in stock. The shorts have been designed to compliment you Alpe d’Huez, Galibier or Ventoux Jersey with the same two blue stripes. Order by the weekend (07/12/2013) and we will send them out express delivery so you should get them in time for Christmas. We love this photo of David from Australia hammering up the mythical 21 bends of Alpe d’Huez.